Theoretical physicist Walter Kohn, who shared the 1998 chemistry Nobel prize with John Pople for developing density functional theory, has died at his home in California, US, aged 93. Kohn was born in Vienna, Austria in 1923 to Jewish parents. He managed to escape the country thanks to the Kindertransport operation in the 1930s, following Austria’s annexation by Nazi Germany. He lived with a surrogate family in Sussex in the UK for several years, before being interned in 1940 because of his nationality. Moving between internment camps in the UK, and later Canada, he was educated by various academics who were ‘enemy aliens’ themselves. During this time he developed an interest in science, and when he began undergraduate studies at the University of Toronto in 1942, having been released from internment, he focused on maths and physics. Being a German national, he was still not allowed inside the chemistry department as work central to the war effort was still ongoing. 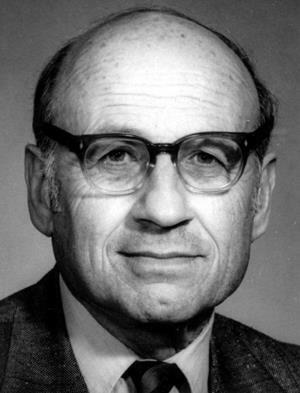 After completing bachelor’s and master’s degrees, and serving in the Canadian army, Kohn moved to the US to study for a PhD at Harvard University under the supervision of theoretical physicist Julian Schwinger, who went on to win a share of the 1965 physics Nobel prize for his work on quantum electrodynamics. After completing a brief postdoctoral fellowship at the Niels Bohr Institute in Copenhagen, Denmark, Kohn moved back to the US and Carnegie Mellon University in 1950, where he worked for the next decade. It was here he undertook the work that led to the development of density functional theory, a computational modelling technique that made it possible to take quantum mechanics into account when studying the electronic properties of materials. In 1960 Kohn joined the University of California (UC) San Diego’s department of physics, holding a term as department chair, where he stayed until joining UC Santa Barbara in 1979 to serve as the founding director of the Institute for Theoretical Physics. He remained at UC Santa Barbara for the rest of his career.